This delicious Pumpkin Hummus recipe screams autumn. Loaded with delicious flavours, this dip recipe can be a crowd pleaser for Diwali and other festive celebrations. Place Pumpkin on a lined baking tray along with (garlic covered in a foil) and roast at 180 C for 30 minutes. Allow the pumpkin to cool down. Scoop out the flesh and keep it aside. You will yield approximately 1 1/4-1 1/2 Cup Pumpkin Puree. To the bowl of a food processor, add roasted pumpkin, chickpeas, lemon juice, ground cumin and garlic cloves,olive oil, maple syrup and water in a food processor.Process until smooth. Taste and add more lemon juice, salt & pepper as needed. 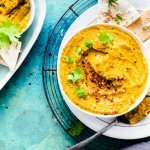 Transfer the Pumpkin Hummus to a mezze bowl. Garnish well with extra drizzle of olive oil,chilli flakes and fresh coriander leaves. Pumpkin Dip will keep fresh for 5 days in the fridge, covered. If you are using a can a Pumpkin Puree, omit the water in the recipe.